Home/People and Sound/Examine the Earth/How is sound used to study underwater volcanoes? Underwater volcanic eruptions can be hard to detect and observe. Volcanic eruptions produce earthquakes that are typically detected and measured by seismometers on land. Smaller underwater volcanic eruptions that are far away from land will go undetected by land-based seismometers. When a volcano erupts underwater, it will produce acoustic energy in two ways. First, as the eruption occurs, lava, ash, and/or gas enter and interact with the water. This release of volcanic material creates sound. Second, seismic energy from earthquakes associated with the eruption is converted to underwater acoustic energy at the seafloor-water boundary. 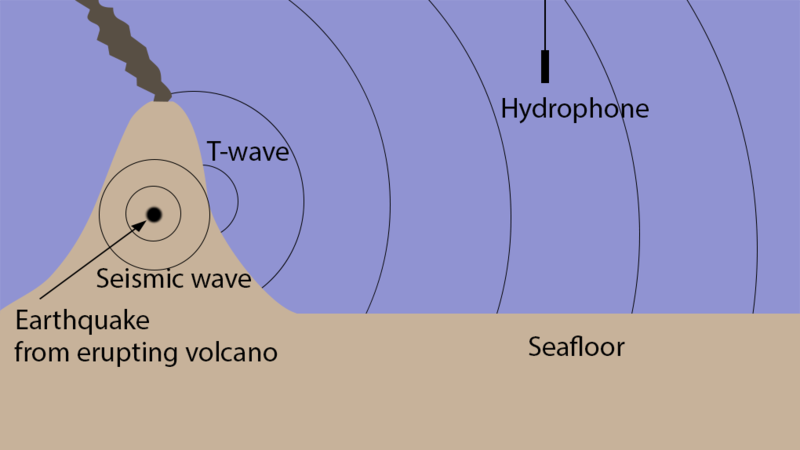 The acoustic signal from seismic waves produced by conversion of seismic energy is called a Tertiary wave (or T-wave) that can be detected by hydrophones at great distances. The T-waves have frequencies of 4 to 50 Hz and are a significant source of ambient noise in this frequency band. Researchers can use acoustics to study underwater volcanoes. They may use hydrophone arrays, such as the Sound Surveillance System (SOSUS) and the Comprehensive Nuclear-Test-Ban Treaty (CTBT) hydroacoustic monitoring system. For 20 years, researchers have used a SOSUS array in the northeast Pacific Ocean to monitor the region off the U.S. and Canadian West Coast where there is a section of mid-ocean ridge. 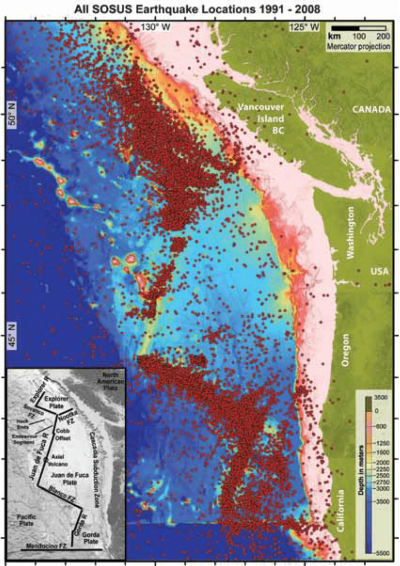 Northeast Pacific ocean earthquake locations (red dots) derived using the US Navy SOSUS-NOAA hydroacoustic monitoring system from September 1991 through January 2011. A total of 47,934 events were located using > 3 hydrophone stations from throughout the northeastern Pacific. Image from Dziak, R.P., S.R. Hammond, and C.G. Fox. 2011. A 20-year hydroacoustic time series of seismic and volcanic events in the Northeast Pacific Ocean. Oceanography 24(3):280–293. Spectrum from the West Mata eruption acoustic recording made approximately 20 km from the volcano recorded by an underwater glider. The glider recorded frequencies up to 850hz. Wide-band signal from the volcano produced a range-dependent interference pattern as the glider progressed through the water column. Gaps in the recording are a result of mechanical noise on the glider. Image modified from Matsumoto, H., Haxel, J.H., Dziak, R.P., Bohnenstiehl, D.R. and Embley, R.W. (2011) Mapping the Sound Field of an Erupting Submarine Volcano Using an Acoustic Glider. The Journal of the Acoustical Society of America, 129, EL94-EL99. Acoustic observation of volcanoes gives researchers data about the activity and frequency of eruptions where they would otherwise have very little data. When used on a particular volcanic eruption, hydrophones can also be used to continuously characterize the details of an eruption, such as variability in the eruption rate, eruption style, and precise location of the eruption on the volcano. NOAA PMEL video – listen to Honshu, Japan Earthquake, 2011.